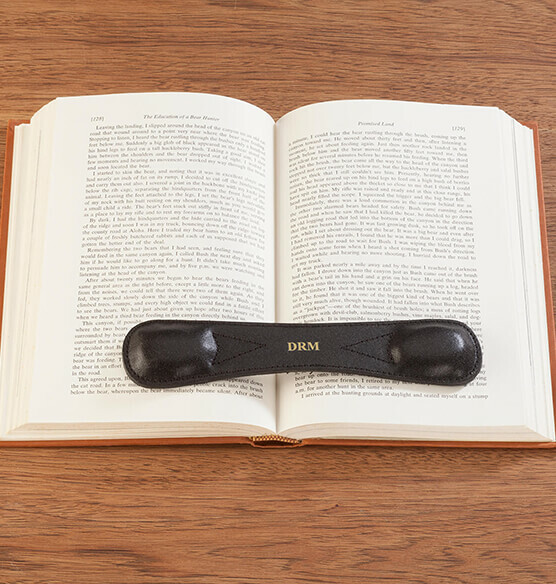 Traditional leather weighted bookmark is very handy for all readers. The weighted bookmark ends hold the book open without breaking its spine, and the suede back stops sliding. You’ll be the most stylishly prepared at your next book club meeting with this unique bookmark. This weighted bookmark keeps pages open without disturbing the integrity of the bookbinding and stay-put thanks to the suede backing. The suede backing also keeps the marker where you left off so you can quickly find your spot when you return to finish your book. This stylish leather bookmark gives you the option to personalize with your initials in brilliant gold font or leave it plain for sleek style. The multiple color choices provide you with plenty of opportunities to show off your style and also give you a different color for each book you’re enjoying. Whether you’re shopping for yourself or looking for the perfect stocking stuffer this holiday season, make Miles Kimball your first choice for hobbies and books that’ll make you everyone’s favorite Secret Santa. Specify color: blue, green, natural, red or black. We’ll personalize with three gold initials. Specify initials in order (first, middle, last). Leather front, suede back. Leather book weight is 8 1/2". Several of us at work ordered these bookholders and loved them. We just put an order in for 19 more to give as gifts and stocking stuffers. Everyone that saw us using them at lunch to hold our book open while we read wanted to know how they could get one too! We love this product!! My elderly mother needed this bookmark for reading while eating. Somehow we lost it (maybe fell in the trash), but I re-ordered one in the color of Red, and with her initials. This one will surely show up, even in the trash!! A must for anyone who likes to read while eating or drinking at home or in restaurants or coffee shops. Great device. Love to use it while I'm eating and reading. I carry it with me whenever I carry by book. I can sit and have lunch and read my book without the pages turning on me. Love it! Get many comments about it from waitresses and other customers. This product was exactly as advertised. The initial engraving was a nice touch too, especially at no extra charge. It looks very good & does it's job well at a great price. I had seen one of these a couple years ago and had not been able to find one till now. I love it! It makes reading, cooking, everything I like to do hands free so easy. Great gift idea for some of my book loving friends! Weighted ends hold even the most stubborn pages in place so I never miss a beat playing the guitar or any other instrument with the band. Keeps Bible open to correct passage when comparing it was other books, commentaries, etc. Great sharing this with my friend! I have had one of these for years and have had many people ask me how to get one. I got this for my friend and she is thrilled! I haven't seen anything comparable to this. Mine is still as sturdy as ever and is still in good shape. Reasonable price. Thank you. These are great for home or office to help keep book open. Gave as gifts also! I am getting another one!! I like to be able to read while I am Having a cup of coffee or having snack now I can let go of the book on my lab and not lose my place. I bought 2 of these, one for home and one for the office. I already know I will be ordering more for friends! Use mostly for book reading. Have given to friends for gifts. Ideal for students. It allows you "hands-free" reading to grab coffee,a tissue, the phone, or a writing instrument and not worry that you will lose your place. Read outside..the wind won't blow away your page! Highly recommend! Great to keep papers held in place. I bought this to replace one that broke after using for several years. this is the perfect item to hold your book open for hands free reading while eating. Can also be used to hold books open while cooking or baking. The weights on either end are just enough to keep the book open. I have bought several for myself and as gifts. The bonus is personalizing it. This product has been great at holding the pages open on Crossword, sudoku, and other puzzle books. Even assists in reading. I often read books while eating. The Leather Weighted Bookmark is perfect for keeping my book open to my page. I love this item! Keeps pages flat when I read and is easy to move when I need to re-position it. I plan to buy several as gifts for my friends who still enjoy reading a real book. This bookmark is so great--whether for reading a novel or holding open a cookbook--that I went back and bought five more for members of my family. They are sturdy and long enough to do the job effectively. I gave this to a book reader who usually used a deck of cards to hold her books open. She was thrilled with this gift, and uses it daily. Great quality, great product. Anyone that likes to read books should own one of these! This book holder replaces the one I lost at work last year. The new replacement isn't as heavy as the old one, but it's longer and puts less pressure on the book. It makes it a little harder to read new books. But, at the same time, does less damage to new book spines so I can pass them on to others easier. THANKS for the wonderful product. This is perfect for holding down the pages either while you read, or if you need to put the book/reading material aside for a bit. I travel on a commuter bus frequently and the seat backs have trays that pull down, perfect for leaning the book on. THIS HELPS TREMENDOUSLY. I love it. I gave the others as gifts and they were received with GREAT appreciation. Of course, they LOVED THE PERSONALIZATION. It makes the gift just extra special. Thank you! My husband and I each have 2. I have one in my purse, one on my desk. They are great for reading and taking notes for a paper or lecture or just pleasure reading while eating lunch. Friends loved these. Many read out on patios and this gadget will control the wind. --Many read while eating - hands are free to do that. --Works well for cookbooks too. Fantastic item. Very heavy to hold down the pages, well worth the money. Great piece! Obviously Reading, Hold Open A Recipe Book while cooking, On A Desk As Paperweight, Carry ours everywhere. Friends rave about them as gifts. Different colors please most everyone. My wife has wanted one of these for ages so she could perform hands-free real book reading. I got this as a surprise and she was delighted. I've purchased this product previously. I like to read and it is very helpful when I want to read while eating a meal. It is heavy enough to hold open a book, but not too heavy to carry in my purse. This year I decided to give some of these weighted bookmarks to some friends for Xmas. They were very excited to receive this gift and are looking forward to using it. I've bought four of these at various times, two for myself and two as gifts for friends who have difficulty holding a book open --- one with painful arthritis in her hands and another who is recovering from recent hand surgery. Both have raved repeatedly about how helpful this item is. MY FAMILY LOVES THESE WEIGHTED MONOGRAMED BOOKMARKS! THEY ARE GREAT TO USE OUTSIDE ON THE BEACH OR THE DOCK TO HOLD YOUR PLACE IN YOUR BOOK, AS WE ARE ALL AVID READERS, ESP IN WINDY WEATHER. THEY LAST FOR YEARS, BUT MY SISTER LOST HERS AND MY NIECE WANTED ONE, TOO. I WILL PROBABLY REPLACE MINE, IN CASE THEY QUIT MAKING THEM, BUT I SURE HOPE NOT! Aid for stroke patient who had trouble keeping books open when reading. Gift for my grandson to use during his Bible studies. High quality, very pleased with it! I purchased two of these bookmarks, one for the office and one for home. They are great and really make reading so much easier. They don't slip or slide even if the book is at an angle. And they look really nice too, especially with the personalization. My only regret is that I didn't purchase them years before. It keeps my book open so that if I have to use my hands I don't loose my place. I can also more it along to keep my place on the page. It is nice that it has a non slip backing that lightly hold is place on the page but is easy to move as you read. I am very pleased with this product. I use this to hold the pages of my book open while I'm working out on my tread climber. Works perfectly - exactly what I needed and wanted. Thank you! Great product for anyone cooking from a book. Indespensible in the kitchen to keep cookbook open. I received one of these bookweights as a Christmas gift years ago and use it almost daily. I bought this one as a gift for someone who likes to read while they eat and had previously been using the edge of their plate to keep their books open. These also make excellent gifts for college students who need an extra hand to hold books open while they work on the computer. I like to use my lunch breaks to enjoy one of my lifelong passions ... reading. These are perfect to allow me to keep my book open and my hands free to enjoy my lunch while I read. I have bought this item repeatedly!!! I bought a leather book weight years ago that I used constantly until I left it unattended at a restaurant and it was stolen. I searched and finally found another at Miles Kindle at a great price so i ordered several; one to use daily and to have some backup just in case. I read in public places while waiting and I frequently get asked about the book weight so I have ordered several for friends and in fact just received an order for 10 more of them to give as gifts this Christmas! They work well and are made of quality leather with suede underneath to protect the book, magazine, etc. You can get them personalized with free initials and they are shipped quickly. I highly recommend them and advise you to order multiples to satisfy friends and family members who read a lot. By the way, they come in five (5) colors so that each person can have their own personal book weight. I have purchased this item multiple times for gifts. They are always appreciated and loved for their versatility. These bookmarks are perfect for holding open a large cookbook or a small paperback. Also, the quality is very good! They are heavy - not flimsy at all. Second one purchased. First was for wife and she would not be without it. This one was a gift for wifes best friend. Can not over recommend. Must have for avid readers! These bookmarks are great! Allows hands free while reading a novel, cook book, etc... No more trying to balance a cell phone or spoon to hold the book open. I have given them as gifts, and my girlfriends love them for the office. My husband and I use them daily with our studies. We have also given several of them as gifts and they are appreciated. I bought my first weighted bookmark years ago. It's worn but still good. Taking it to work for break time. Ordered new one for home and a friend ordered one too. We LOVE them! Makes reading both paperbacks and hardbacks so easy if you happen to be eating. Great for cookbooks and your Bible too! Our Sunday school class loves them! The adult ladies Sunday school class can easily keep our place while moving back and forth in our class. The bookmark is heavy enough to keep our places. Even though I have a Kindle, I love the feel of books. These book markers prevent having to turn down pages or losing ones place altogether. The weight is perfect for holding previously read pages out of your reading zone. I use this great bookmark to hold professional books open when I'm working on lesson plans, or just reading. I gave books for Christmas, and every book came with a personalized, weighted bookmark. They were a big hit, even if people were perplexed at first about what they were for! Well-made,[...] I'd buy again. I love this! It works perfectly, keeping the book pages down. I need to read to go to sleep, it saves my place and allows me to read with the book flat and it stays there!! I've used these weighted bookmarks for a number of years and somehow lost two of them. The newest one is actually a bit larger than my previous ones. I use them to hold open novels while eating, cookbooks while my hands aren't free. Great as gifts, too! Wonderful product! I've used this for several years and think it's great. I gave these as gifts to many friends - they liked them for several reasons, to include that they were useful and that they don't have to be dusted (the less of that at our ages, the better!). My friends really enjoyed them. This is the second one of these handy little bookweights I've bought. I had to buy a second because I lost the first one while traveling. I tried for the longest time to just do without it, but missed it too much and eventually broke down and bought another. My only complaint is that this replacement is just a BIT lighter than the old one I had, and therfore doesn't hold certain books as well. Other than that...I love it. For holding open books that don't have very stiff spines. New paperbacks won't be held open. Holds place in cookbooks, textbooks, or any kind of reading material. Fun gift with personalization. Useful and durable even though too short for large books. I have several in different colors to help keep track of where I am while teaching. I had already owned one of these book weights and bought 8 more for the members of my book group. they loved them. One member even suggested using hers to hold her ebook cover open. Never thought of that but she said it works nicely. All the items I have purchased are Christmas gifts, so I won't know how well liked until after that. Needed something to hold books open while reading at the table. Remembered seeing the bookmark in your catalog. Perfect for my needs. Also ordered one for my son. This is useful whenever hands must be free. In the kitchen, this bookmark holds open cookbooks with standard bindings freeing hands to follow recipes. Also useful for reading books while you eat a meal! When typing, this would also help keep reference books open. There are many possible uses. I bought these to give as gifts. It would be nice if you offered "gift service" wrapped with a gife card saying who it was from would be nice. I read while I eat and I like not having to hold the book open at the same time. ... but I was slightly deceived by the word "bookmark" in the product name. For its intended purpose--holding the book open to read if it's on a flat surface--it's great. I was actually hoping to also use it as a bookmark but that's impossible due to the weighted (lumpy) ends. For that reason I gave it the average rating. Just rename the product, Miles Kimball, and it will be fine! For the price, a good value. However, the leather on one end is gathered in the stitching and there is a bubble in the leather on the same end which appears to have let loose from the weight underneath. This is my third book weight, the first that appears to have been made overseas using inferior materials, processes. I added flannel backing so it does not slip off my book, but am disappointed in the down-graded quality of of one of my all-time favorite reading tools. This is the 2nd time I've ordered these bookmarks. The quality with the 2nd set is well below the first set. These are extremely flimsy and I will not order these again. This is a great product but be careful of personalization!!!!! The instructions were very vague as to order of letters. I wasn't sure if they wanted me to put the last name in the middle (as it should be when done) or if they wanted to initials in order of the full name so they could order it correctly. I CALLED TO ASK THEM!!!!! I was told by the woman to do first, middle, last and that they would properly order them. I said, "Are you sure?" "Yes," she said. How did it come??? First, Middle, Last (as opposed to First, Last, Middle - as proper). Completely disappointed and it will now be more of a joke than a NICE gift. Thanks a lot. I'll never order from this site again because of this incorrect ordering advice. Too bad because otherwise it's a great product. Hope this review saves some of you from potentially making the same mistake due to their bad instruction and horrid Customer Service instruction. My Grandson's thought it was some kind of a Ninja fighting thing. It is useless as a bookmark.